The New Motorola XTB446 is a great choice for organisations who require short range communication in a business grade product. 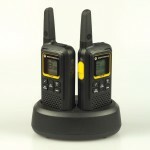 Each pack includes two radio handsets, belt clips, NiMH rechargeable battery packs and a desk top two-unit charger. W..